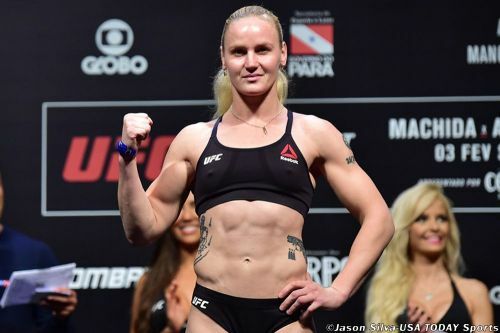 UFC flyweight division champion, Valentina Shevchenko, has made her pick for the co-main event clash at UFC 232 between current featherweight champion, Cris Cyborg and challenger Amanda Nunes. UFC 232 is scheduled to take place on December 29th, 2018, to a sold-out crowd at the T-Mobile Arena in Las Vegas, the main event to which will belong to a rematch between Jon Jones and Alexander Gustafsson. The co-main event of UFC's last outing at UFC 231 featured a flyweight championship fight between Valentina Shevchenko and Polish fighter, Joanna Jedrzejczyk. The fight rose up to the expectations of fight fans by going the entire distance of five minutes, by the end of which, Shevchenko was awarded the victory via unanimous decision. Following this win, Shevchenko seems to be ready for her next opponent, who could very well be her arch-rival from the past, Amanda Nunes. Current featherweight champion Cris Cyborg last competed in a title fight against amateur Russian female fighter, Yana Kunitskaya, at UFC 222, where the former dominated Yana with a first-round technical knockout victory. Cyborg's upcoming challenger, Nunes, was last seen in contention at UFC 224 when 'The Lioness' went on to successfully defend her women's bantamweight championship, via technical knockout, against the tough, Raquel Pennington. “Cris has an advantage in her endurance – a very huge advantage, because she’s training like a fanatic. And most important, she’s not tiring." When asked about her rivalry with Amanda Nunes, Shevchenko clearly expressed that she still has an unfinished score to settle with the Brazilian striker. UFC 232 promises to exceed the expectations of fans around the world, thanks to its stacked co-main event and main event fixtures. With Nunes moving up to featherweight in an attempt to claim Cyborg's 145-pound belt, it will be engrossing to see what both fighters have in store to display to their fans, come December 29th. Who do you think has the champions edge between these two high-quality contenders? Leave your predictions in the comments section below!